I wanted to express my sincere gratitude for the job you and your field crew did at the above Carolina Bank Headquarters project. Nothing but positive comments were made during the grand opening and customer appreciation day held October 4, 2008 at the new Carolina Bank Facility. Smithson, Inc. constructed approximately 300,000 sq. ft. of new construction for Universal Leaf Tobacco Company in Danville, VA. The project scope included a 200,000 sq. ft. post tension floor system with a FF of 65 of which American Concrete provided the design and construction. They also provided all the footings, foundation walls and other conventional floor slabs for this project. American Concrete performed this scope of work to meet our schedule in a very proficient manner and we view them as a leader in the concrete placement industry. We have developed an on-going relationship with them and I highly recommend them for any project. Mericle Commercial Real Estate Services is a real estate development firm operating in Northeast Pennsylvania. Mericle Construction Inc. of Wilkes-Barre Pa. is a licensed general contractor. 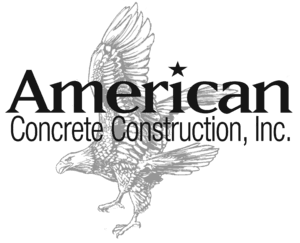 American Concrete has completed several flatwork projects for us over the past two years totaling in excess of one million square feet. All projects were completed in a professional manner, on or ahead of schedule and meeting or exceeding job specifications. The Solaris Team of Howard Shockey & Sons would like to thank you for your outstanding individual performance during the building of the Solars Paper Warehouse. It was with your diligence and professionalism, that as a team, we were able to meet the strict scheduled requirements. Workers like you, make projects like this a success. We look foward to working with you again.